Boom Brothers, a mining-themed Net Entertainment (NetEnt) 3D slot, has two bonus features, generous multipliers, and a top fixed jackpot of 7,500 coins. Playing Boom Brothers is as simple as placing the bet, spinning the reels, and collecting payouts if a winning combination is displayed. Players can activate as many or as few of the 20 paylines, bet up to 5 coins per active line, and choose from a coin value range of $0.01 to $1.00. The max bet for Boom Brothers is therefore $100.00 per game. Players can also customize their gaming experience using features such as Autoplay. Boom Brothers, an exciting 3D video slot, is based on three miner brothers mining for rubies, diamonds, and gold. The slot features splendid graphics, entertaining animations, and realistic mining sound effects. It gives players the feeling of going on a treasure hunt and unearthing plenty of riches. The reels feature symbols of the three Boom Brothers, mechanical robots, and mining lamps, pails, picks, and helmets. The Bomb symbol serves as the wild, which players can use to complete winning combinations as it substitutes for all other icons except for the scatter symbols. Boom Brothers has two scatter symbols—the Free Spins symbol and the Rail Track symbol. The former appear all over the reels, but the latter appear only on the first, second, and third reels. If players land at least three Free Spins scatter symbols, they will receive free spins with tripled wins. Players need to click on one of the Free Spins symbols to find out the number of free spins they have won. Players can activate more free spins while playing a free spin. If players spin three Rail Track symbols anywhere on the first, second, and third reels, the Rail Track Feature gets activated. This feature challenges players to complete a rail track for the Boom Brothers to cross over. If this happens, the Boom Brothers Feature gets activated. As soon as players complete the rail track, they will receive a multiplier of x4. In the Boom Brothers Features, the Boom Brothers will race to blast a rock. 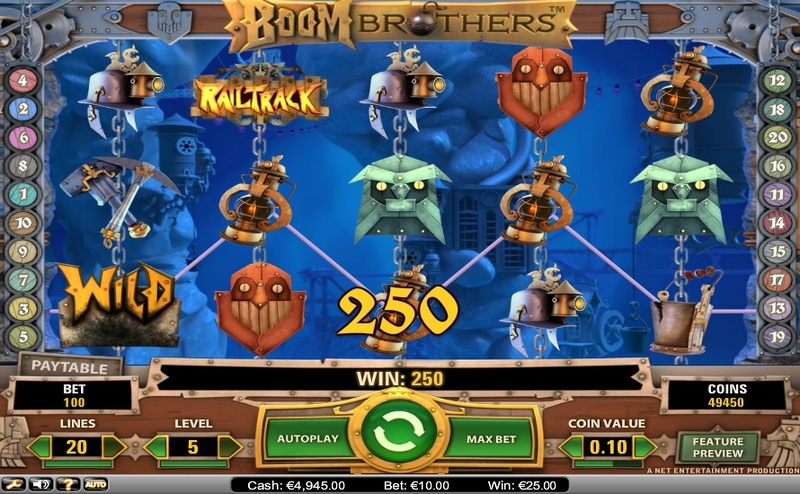 Players will be prompted to select one of the three mining carts displayed on the reels to reveal a ruby, a diamond, or gold, along with a multiplier value of up to three, indicating the number of steps a Boom Brother can move. Players have to continue selecting mining carts till a Boom Brother reaches the rock. The slot comes with a unique Second Chance Win Feature, which gets activated at random whenever players do not land any winning combination and gives players another chance to spin a winning combination. Boom Brothers is available for fun or real money at any NetEnt online casino.